I am delighted to announce that I have just finished my first fully illustrated book. 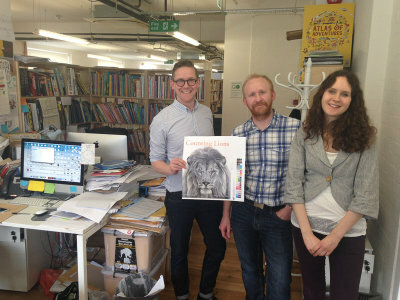 The Counting Lions Team - Me (in the middle), Andrew Watson (designer) and Katie Cotton (Editor and Author). Photo was taken by Rachel Williams who commissioned the book. Titled ‘Counting Lions - Portraits From the Wild’, it is being published by Frances Lincoln Children’s Books. Initially inspired by my fascination to compose images of animals in set numbers, the basic concept was simple: a one to ten counting book with a variety of animals illustrating each number. This idea developed to include simple and elegant poetic text about the animals. The foreword has been written by Virginia McKenna, founder of The Born Free Foundation and star of the classic film ‘Born Free’. Virginia acted as consultant on which animals to include in the book, many of which are animals Born Free are actively involved in protecting in the wild. A 5% royalty will be donated to Born Free for every copy sold. The photograph shows me (in the middle), Katie Cotton who not only wrote the beautiful text, but edited the book as well, with Andrew Watson who created a clean and simple design for the book that works so well with both the drawings and words. The sheet Andrew is holding is the front cover. The book will be available in the UK and USA October 2015, and hopefully other countries in the new year. Click here to go to it on Frances Lincoln's site.